You can find it on the Comparison page. As a suggestion, it would also help your spelling and vocabulary retention if you write the sentences completely, not just the new comparison expression. I look forward to receiving your responses. Writing ~ Can Writing be Taught? Everybody has an amount of talent, whether they are aware of it or not, but we won’t be looking into this right now. We shall also leave for a future lesson the matter of successful writing, as these are complex and relative matters deserving their own level of consideration. 3)	What can be learned only from a teacher. Most beginner writers find themselves having some doubts in this respect, in parallel to the satisfaction they feel, having finished a piece of work. If the writer then continues to write in this nebulous state of mind, the most that is lost is not so much the ‘knowing’ or the feeling more or less certain that the result is good, but the writer’s satisfaction which lies in the working of that piece. When an author ‘works’ the text that appears on the blank piece of paper, there occurs the excitement of further improved expressions that come to live in the process, which is the actual pleasure of writing. Suffice to say that very few people find this pleasure when writing under pressure and especially when writing in response to an external motivation, like it happens in schools, culminating with the writing exams, where the students don’t particularly want to write, but they have to, because the teacher or the system dictates it. Very few students find the internal motivation in such circumstances and they are the ‘lucky’ ones who can find pleasure even during these activities at school. However, coming back to our present lesson, let us consider what exactly can be learned from books. Well, we learn vocabulary and meaning from books, as well as grammar. In one word, we learn how to choose the language we need for our piece, as well as how to combine this language, in order for us to produce a good written piece. This is something essential for writing, comparable to the ingredients you need for a good dish when you’re contemplating to cook one. In learning vocabulary, as we’ve seen on the occasion of our reading lessons previously, we manage to ‘shape’ the world according to the words we acquire from books and from dictionaries (nowadays also from audio sources such as radio, films and music, as well as from online chat-lines and conversations with friends, pen pals, etc.). A good recommendation is that you should constantly build your own dictionary of words you can and wish to use in future writing pieces. This is an arduous process, but those who undertake it with pleasure will be able to show the results and will take pride in their work. In learning elements of grammar and style, one needs to practise regularly, and after a while the best and correct expressions will magically appear. Even the most well-renowned writers in the world had to go through this laborious process, whether they wrote (and are writing) in their own language or in a foreign language. This process makes the difference between the baby-language children use and the mature and professional use of language, depending on how much effort one puts into developing this aspect of their communication skills. It's time again to challenge our fears of spelling correctly in English. We have an easy game today, however, intermediate students can also select a more difficult level than the default one, as you shall see. Let's dig into the SpellaRoo game! Choose your level to start. 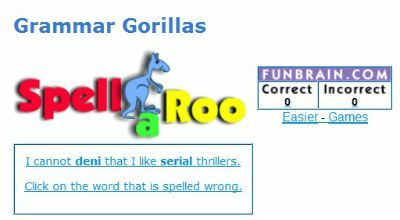 You will be given a sentence on each screen, in which you'll have two words in bold letters. 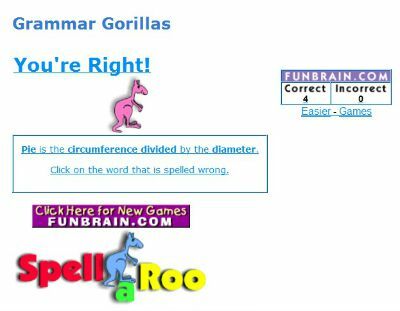 One of them is spelled correctly and the other one is wrong. Can you spot the wrong one? For you to realise which one is wrong, you will need to know the meaning of that word in the context given. After you pick your choice, you'll be told if you're right or not. If you're right, you won't get anything else about these words and you can proceed to the following sentence. 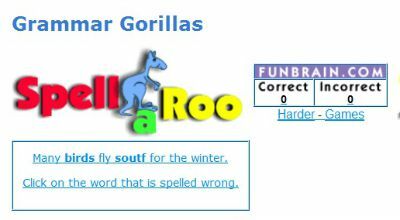 If you're wrong, the game will point out for you which word you should have chosen and its correct spelling. You do get some more advanced vocabulary this time. I advise you to get your dictionaries out and flip some pages, if you don't know the meaning or spelling of these words, instead of just guessing your answers. For example, did you know the difference between 'pie' and 'pi' - both of them being pronounced /pai/? So, that's it - simple. 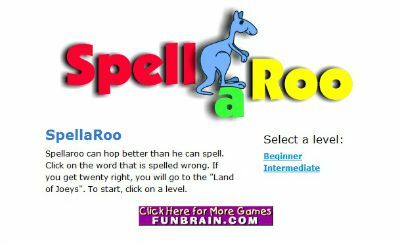 Your turn now, go ahead and play the SpellaRoo game... Practise and have fun!